Save 8¢ per gallon when you use your SaveNOW Consumer Gas Card! The SaveNOW Consumer Gas Card is the perfect way to save money on every gallon you purchase! Looking for an easy way to save money every time you fill up at the pump? The Great Stops SaveNOW Consumer Gas Card is the perfect way to do just that. No hassles, no fees, no waiting to collect rewards. Just instant savings with an immediate price rollback at the pump! Need a snack or drink? No problem, this card allows for in-store purchases as well. Simple savings and convenience wrapped up in one card. This card is perfect for anyone and any size family. With the Great Stops SaveNOW Consumer Gas Card you can have multiple cards with just one bank account, making it easy to manage your family's expenses. Every time a card is used you will be notified, to help prevent unauthorized transactions and track your spending. Having a sense of security and knowing that your money is being properly spent has never been easier! 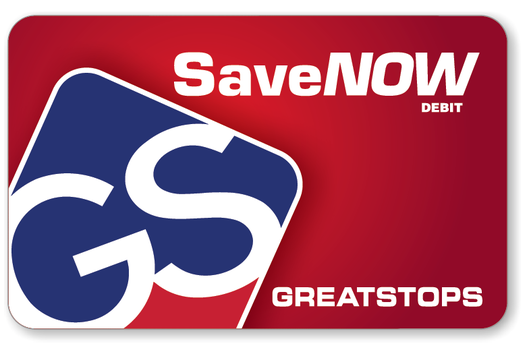 The Great Stops SaveNOW Consumer Gas Card is easy to sign up for, easy to use, and easy on your wallet! Sign up today and start saving! To sign up, please click on the button the right.